In our IoT (internet of things series) we have defined IOT in healthcare as internet connected devices which include: TVs, wearables, mHealth applications, home monitoring devices, implants, mobile/tablet devices and skin sensors. In part two of our IOT series, we examined barriers to adoption and benefits to healthcare organizations. In part three of our IOT series we explored use cases for IOT in healthcare. In part four of our IoT series, we want to focus on the role of leadership to adopting this breakthrough technology. 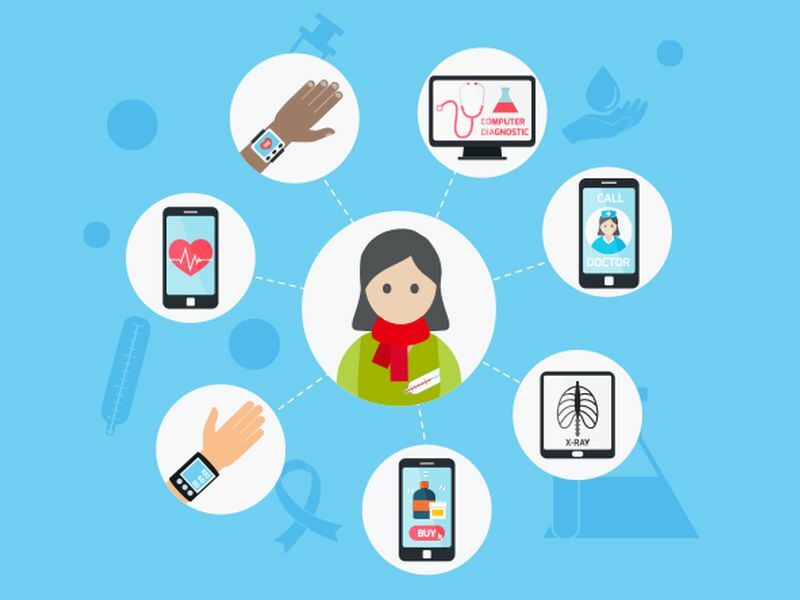 Healthcare executives agree that over the next three years IOT technology will be disruptive. 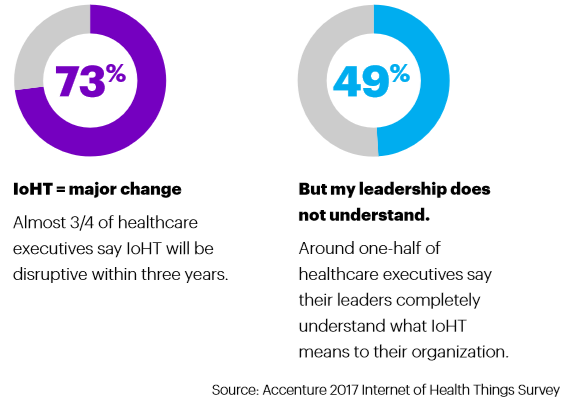 However, about half of the healthcare executives polled by an Accenture survey suggest that leadership does not fully understand what the potential impact of IoT to their organization. Organizations that are implementing IoT initiatives are also realizing a reduction in overall operating costs. Remote patient monitoring is an early warning indicator for providers which helps manage costly unplanned readmissions. The payers are also seeing a reduction in medical costs because of the remote monitoring and the focus on wellness and prevention. This leads to an increase in patient satisfaction and patient engagement because patients are feeling that their voice is being heard, even outside of the episode of care. While some healthcare organizations have seen a benefit from adopting IoT technology, most leadership teams remain hesitant to promote widespread adoption. This hesitancy is driven by an array of concerns. The top concern is security and privacy. PHI and HIPAA are top concerns for many organizations, so adopting devices that connect remotely to hospital systems introduces a risk that did not exist prior to these IoT devices. There is also the reliability and alert fatigue issue in managing remote devices. Legacy systems also present a challenge as most were not designed to integrate with IoT devices. Your organization made a substantial investment in an EMR and the support and training that comes with that implementation. While there are patches, updates and upgrades provided by the EMR vendor, there is additional investment is required to manage information coming from non-native devices. An investment in IoT is not only an investment in today. Rather, it is strategic positioning for the changing healthcare IT landscape of the future. Also, patients are going to drive demand for healthcare to enter the connected world of IoT. Today’s healthcare consumer is looking for ways to interact with their providers through technology. Whether it is scheduling, follow-up or providing feedback, most would rather communicate in the way they do in their everyday life meaning email, text-messages or smart phone apps. When leadership understands the shift in consumerism, the ROI is not far behind. Because the trend is to communicate digitally, organizations can now obtain data analytics to better understand the patient experience. This means receiving actionable insight from patient-generated data that can be key drivers to driving engagement and outcomes. Some leaders see cost, while others see opportunity. There is also a third way to look at it. This information can be managed outside of the EMR. For example, our IntegratedRNTM AI-enhanced digital rounding platform is now connected with TVR’s pCare interactive system to create a 360-degree view of the patient. By connecting different listening posts across the hospital, we can drive exponential insights and value for patients and providers. To learn more about Care Experience and our partnership with TVR/pCare, please click the below.